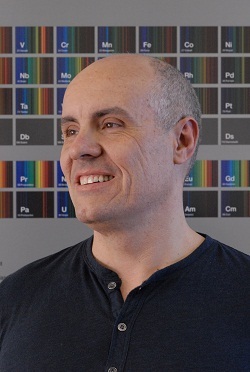 Eliseo Ruiz was born in Neuilly-Sur-Seine in 1965 and studied Chemistry (1988) and Physics (1991) in Barcelona where he obtained his PhD in Chemistry with Prof. Santiago Alvarez. He did postdoctoral work at Université de Montréal with Prof. Dennis R. Salahub in 1993-44, was appointed as Associate Professor at the University of Barcelona in 2001 and became Professor of Inorganic Chemistry in 2011. His actual research interests are mainly centered in the use of theoretical methods to study the magnetic and transport properties of inorganic systems. In recent years he has been also involved in the synthesis and characterization of supramolecular systems with appealing magnetic or photochemical properties. Since 1991 he has been teaching different courses (Inorganic Chemistry, Supramolecular Chemistry, Molecular Electronics, …) in the area of Inorganic Chemistry for graduate and undergraduate students in Chemistry, Physics and Geology.